This year I was looking for something a bit different to round out the Thanksgiving dessert table – and here it is. A two layer pumpkin pie, On the bottom, a rich caramel custard, and on the top a cinnamony pumpkin mousse. And it’s all topped off with an extravagant layer of toasted meringue. Now, I don’t mess too much with tradition – but I like to do “Something Old & Something New” on a holiday. I’ll always make my Pam Anderson’s Pumpkin Pie, an absolute standard at my house. But it’s nice to break out a bit and this gorgeous pumpkin pie is one of my “breakout” recipes this year. This pie is gorgeous, but also a fair amount of work and it has a lot of “chill” time, although any pumpkin pie does. First the caramel is made, then cooked into a custard and cooled. Half of that custard is spread in the bottom of a prebaked & cooled shell. The rest of the custard is mixed with the mousse ingredients and spread on top and the pie is chilled again for at least four hours but I’d recommend overnight. Then the pie is finished with the meringue and toasted. You’ll always want to shop the pre-holiday sales for baking items. I like to stock up on what I need and cherry pick the sales for baking items I’ll need in the next few weeks and all the way up to Easter. Have a use for the rest of the can of pumpkin – maybe my Pumpkin Spice Lattes. Preheat oven to 375 degrees F. On a lightly floured surface use your hands to slightly flatten the pastry ball. Roll pastry from center to edges in a circle 13 inches in diameter. Transfer to a 9-inch deep-dish pie plate. Trim to 1/2 inch over edge; crimp edge lightly to the lip of the plate. Prick bottom and sides of pastry with a fork. Wrap and freeze for 20 minutes or refrigerate for two hours. Line dough with foil or parchment; fill with dried beans or pie weights to the top. Bake 15 minutes. Remove parchment and weights; bake 15 minutes more or until lightly golden. Cool on wire rack. Once cool, you may proceed with filling. In a large saucepan combine granulated sugar, 1/3 cup water, and lemon juice. Stir over low heat until sugar has dissolved. Brush sides of pan with a moist pastry brush to remove clinging sugar. Increase heat to medium-high and cook, without stirring, until a medium amber color (slightly lighter than a penny), about 10 minutes. Remove from heat; pour in half-and-half (mixture will bubble vigorously). Return to low heat; stir until caramel dissolves into cream. Keep warm. In a large bowl whisk together egg yolks, brown sugar, cornstarch, vanilla, and 1/2 tsp. salt until well combined. While whisking, slowly pour about 2 cups of the warm caramel mixture into bowl; continue whisking until well combined. While whisking, pour the egg/caramel mixture back into the saucepan and whisk over medium heat until thickened, about 8 minutes. Transfer to a large bowl; cover surface of cream completely to avoid forming a skin. Refrigerate at least 2 hours. Once cool, spread a little more than half the mixture into the cooled pie shell. Refrigerate the pie. Keep the reserved custard at room temperature as you prepare the mousse. In a large microwave-safe bowl soften gelatin in 2/3 cup water; let stand several minutes. Heat in microwave on 50 percent power 1-1/2 to 2 minutes or until gelatin is dissolved, swirling every 30 seconds. Stir in pumpkin puree, spices, and remaining custard. In a small bowl beat whipping cream until stiff peaks form; gently fold into pumpkin mixture. Spread over caramel in prepared crust. 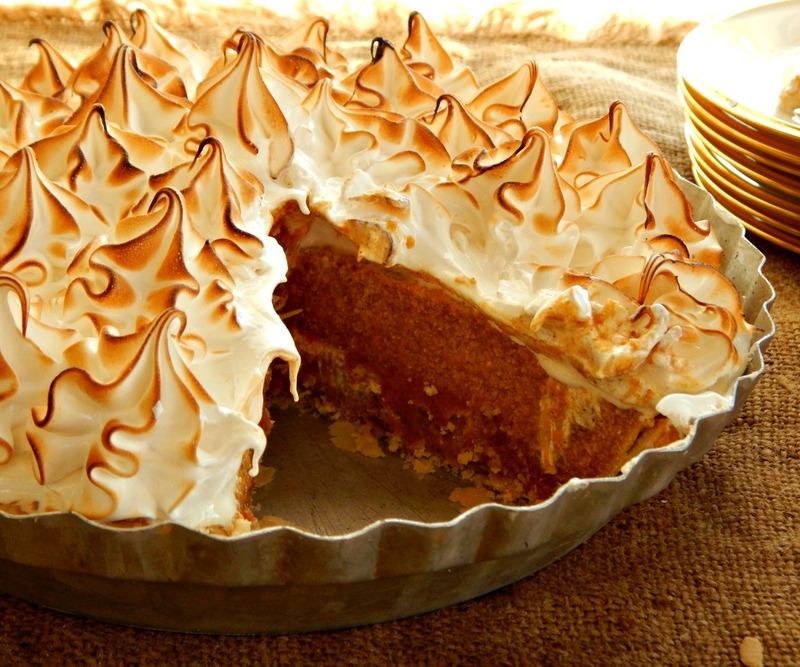 Refrigerate at least 4 hours (preferably overnight) before topping with Meringue. In a double boiler set up (a metal bowl over simmering water) whisk together egg whites, 1-2/3 cups sugar, and a pinch salt. Continue to whisk until egg whites reach 160 degrees F when tested with a candy thermometer, about 15 minutes. Top pie with cooled meringue sealing to the edges of the pie crust. If piping, top with about half of the meringue then pipe decorative stars using a large, star tip. Toast the meringue with a kitchen or benzomatic torch. If you don’t have a stand mixer, divide the heated egg whites into two different bowls and mix half at a time. Don’t leave the egg whites in the bowl you’ve heated them in or they will continue to cook from residual heat. I will be sharing this recipe at our very own Throwback Thursday and Fiesta Friday. Our Fiesta Friday co-hosts this week are Antonia @ Zoale and Petra @ Food Eat Love. Thanks, Fiesta Friday for featuring this pie!! This entry was posted in Click here for Fabulous Food Posts and tagged Better Homes & Gardens, Cream, Frugal Hausfrau, gelatin, meringue, Pie, Pumpkin, Pumpkin Pie, Special Occasion, swiss meringue. Bookmark the permalink. I am ready for something chocolate! Maybe I need to bake some cookies…I’m sure yours was amazing, too! I know. My daughter said after all those pies, I could use a good brownie about now! OMG – stunning. Love your commentary too – so refreshingly honest. Thanks! And I wouldn’t have felt right if I would have fiddled and faddled to get one perfect slice and a beautiful pic and then have someone else making it with that expectation – I always try to tell it how it is. Good or bad, but usually good, because otherwise it doesn’t go on my blog! The morning after Thanksgiving, the last thing I thought I’d want to look at or drool over was pie. But then, this masterpiece!!!!!!!!!! OMG I want some. Gorgeous!!! What a gorgeous pie and your pictures are beautiful!!! Have a happy Thanksgiving! You too, Carlee! And I hope you guys have the best Thanksgiving, ever! Wow what a pie Mollie – it looks so decadent! Thanks much! We all liked it a lot. So delicious! Leave one piece for me please! Wow, Mollie this pie is amazing, and it looks like it is worth the trouble! I love the idea of using a crunchy graham cracker crust. Thank you for bringing your beautiful and delicious pie to Fiesta Friday! Thanks Antonia, and thanks for hosting FF!! I’ll finish off all that toppings first before getting to the pie! ;p I’m not big on pumpkin but this one looks delish! lol, Ann! to tell the truth there was so much caramelly flavor that the pumpkin hardly came through. It was almost just a hint…but good, nonetheless~! You need to change the name to just caramel pie..lol. heheh! Thanks Patrick. It was and I love most pudding type pies and this was no exception! Wow! What a stunning pie! It was really a looker! I loved that the meringue, when toasted had just a hint of smoky marshmallow flavor! Thankyou, Sumith! Child’s play compared to the things you make!! Love those pretty piped peaks. Thanks! I love piping, especially when it’s something that doesn’t have to be precise – because I am soooo messy! This is so beautiful & looks delicious! Thanks, it was really fun and delish and different! Thanks! It really was a nice presentation! That Meringue topping made my mouth wet! It was, and thanks! I still love my plain old pumpkin pie better, though, lol! There’s no accounting for taste, I guess! Thanks! It was gorgeous! A little messy, but gorgeous….